I will explain installation of SAP S/4 HANA 1610. The current version of SAP ERP 6.0 Ehp8 and later versions are called SAP S/4 HANA 1511 because S/4 HANA was released to customers in November 2015. 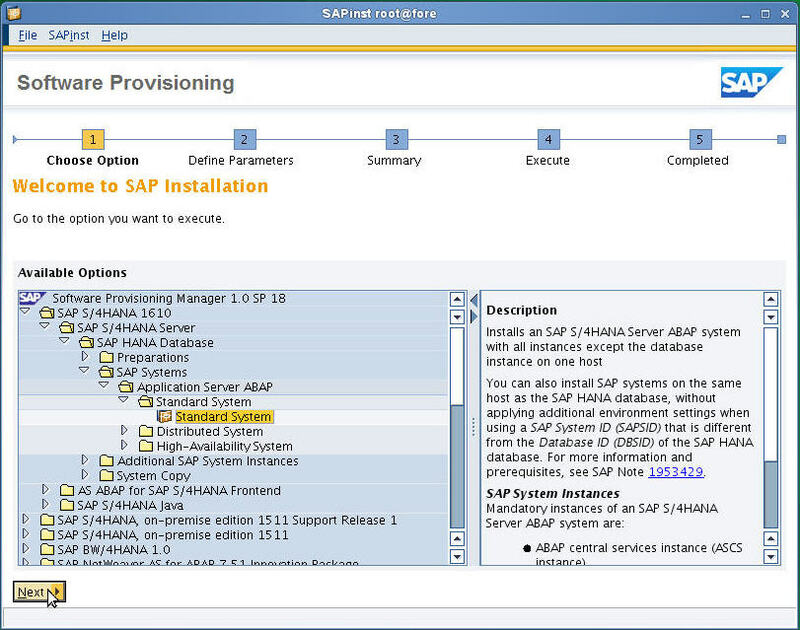 And the version I install now is SAP S/4 HANA 1610 on Premise, released in October, 2016, and is the most recent version at the time of installation. 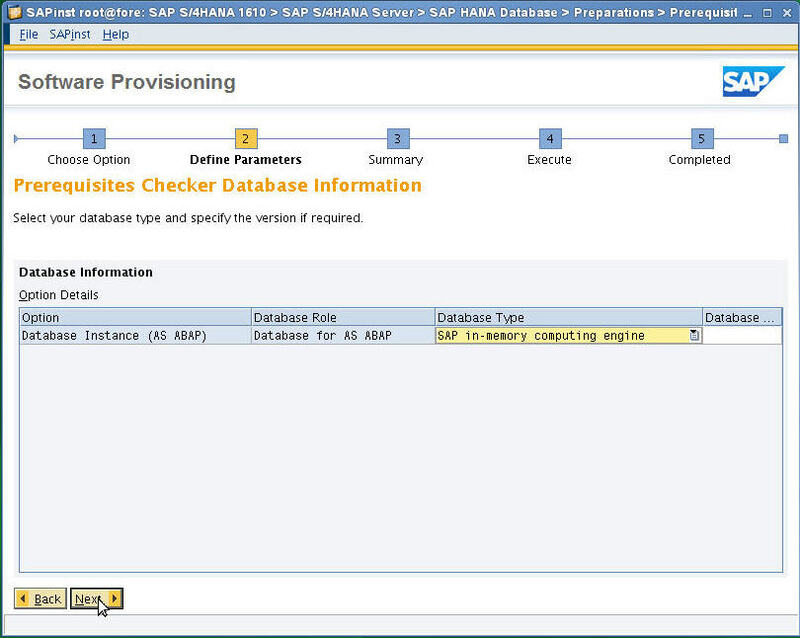 1.The evolutionary change for SAP ERP Business Suite, HANA DB and S/4 HANA version. 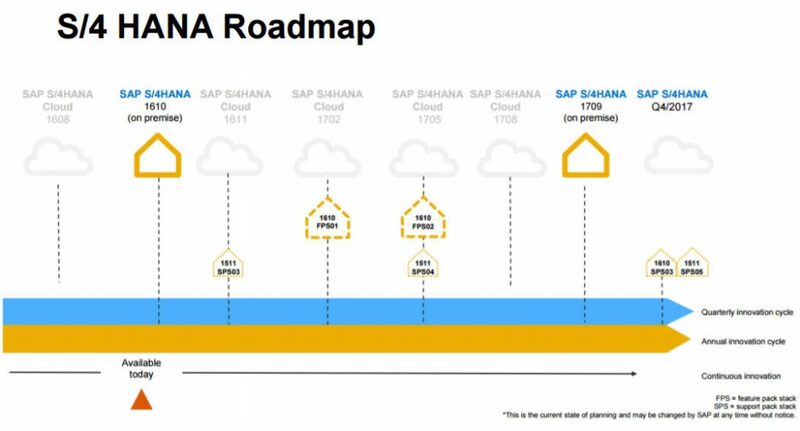 It is easy to understand the simple SAP S/4 HANA roadmap. 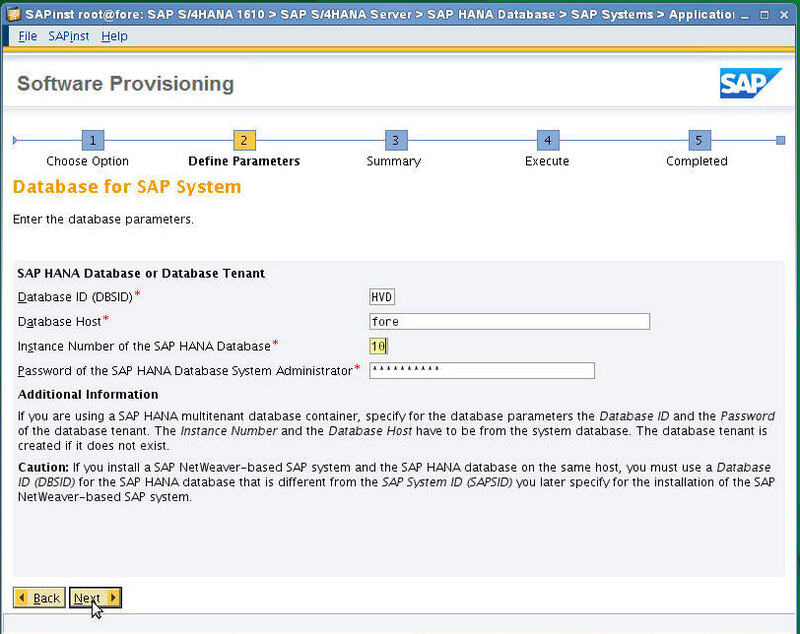 2.The method I try to install is to install HANA DB and S/4 HANA in the same physical space on one H/W. 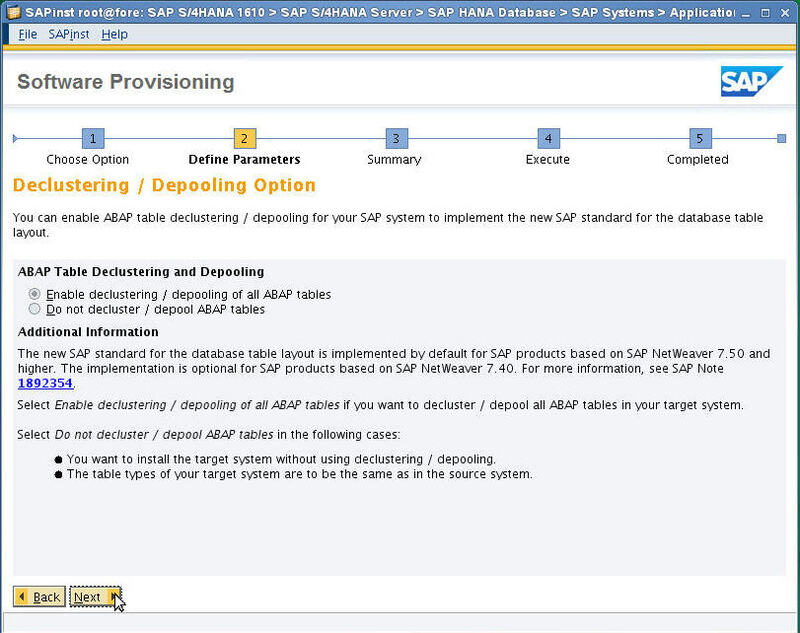 In a company that uses HANA DB as an ERP, the HANA DB is installed in a separate H/W box and the S/4 HANA is separately installed in a separate H/W box. 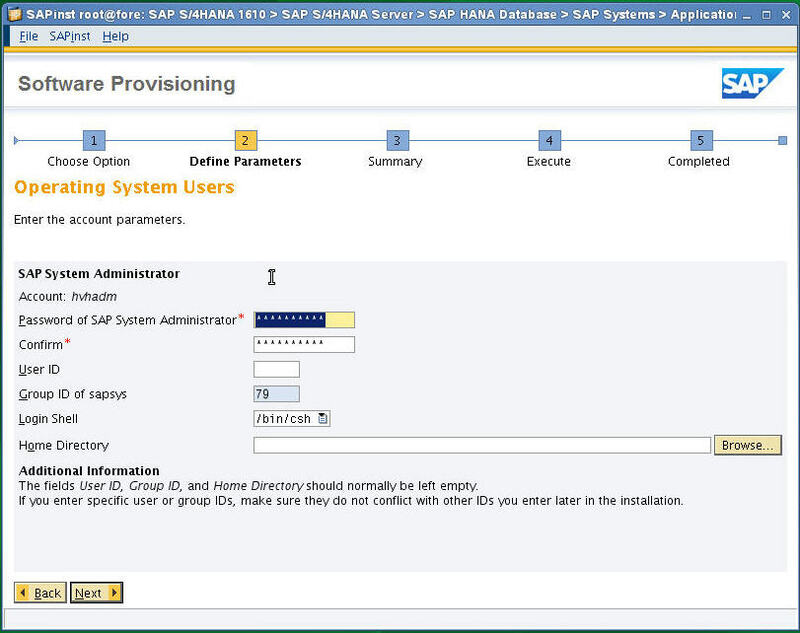 When DB and S/4 HANA are installed together, it is difficult to allocate resources because CPU and Memory are shared, and if DB and S/4 HANA are installed in the same H/W, stability of system maybe becomes poor. 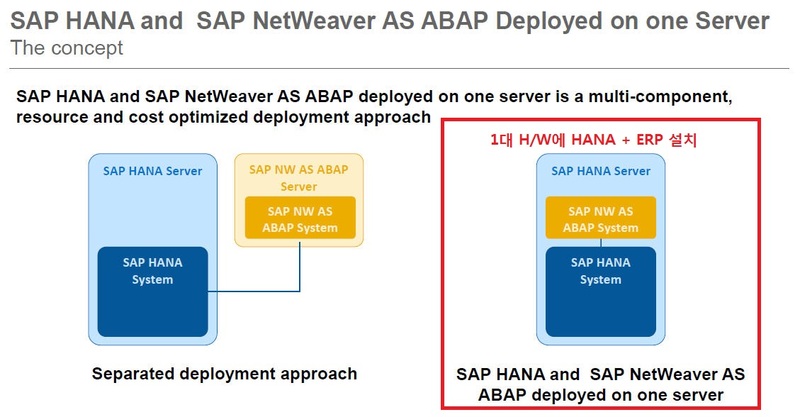 HANA DB and SAP NetWeaver ABAP server are separated from each other as described in the left of the figure, because H/W resources (CPU, Memory) are separated and the same H/W. Can be reduced, and the cost savings for H/W. You can be expected. Instead, the CPU and memory are shared, which reduces stability. 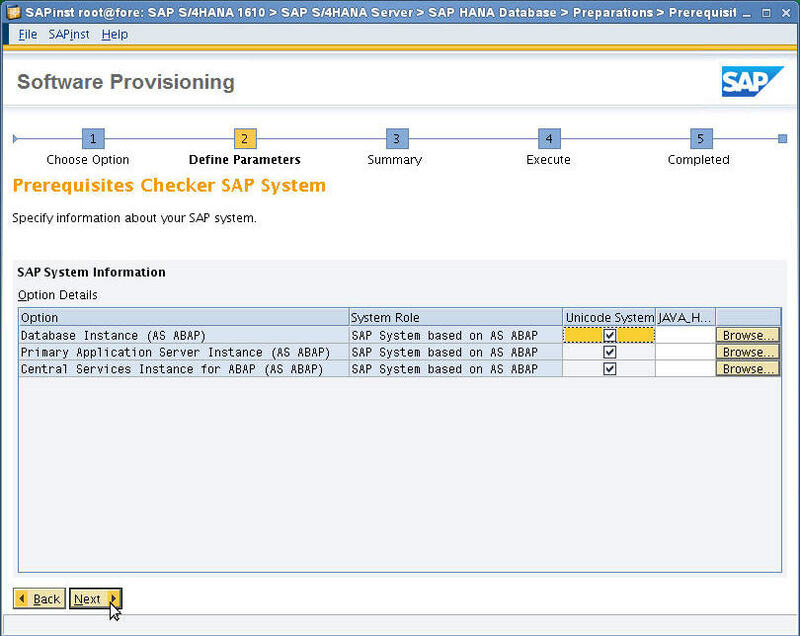 Here is the contents to install HANA DB and S/4 HANA together on one server (one H/W) to the side I installed today. 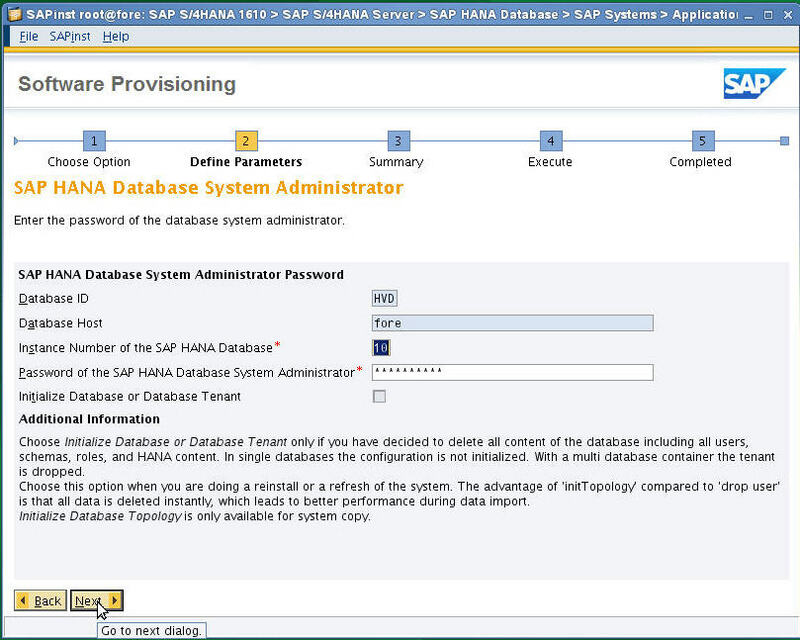 3.Now, we will install S/4 HANA in HANA DB on one server (H/W). 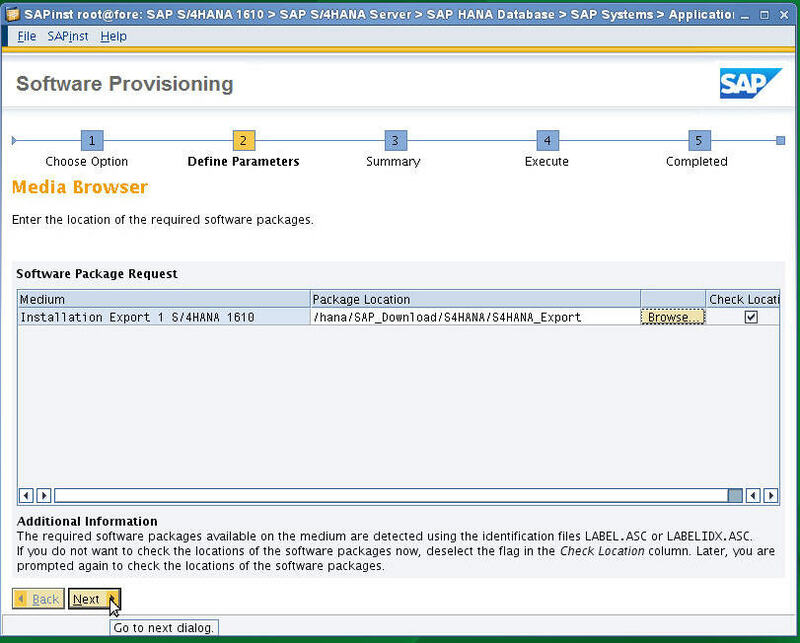 3-1) After decompressing one SWPM(Software provisioning manager), run sapinst to start installing SAP S/4 HANA 1610. 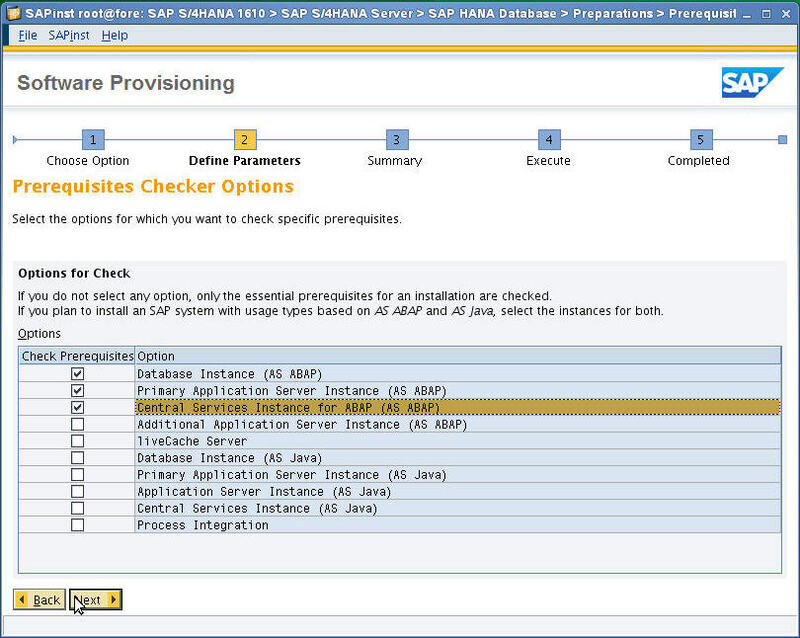 3-2) Before starting the SAP S/4 HANA 1610 installation, first check the prerequisites. 3-3) Select the server type on which you want to perform the installation. 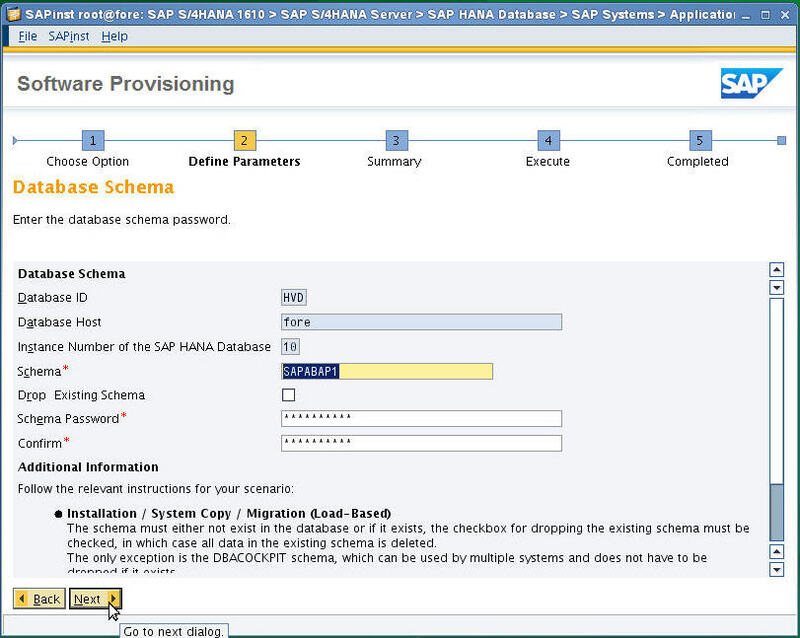 3-4) Select Data Type as HANA DB, SAP In-Memory Engine. 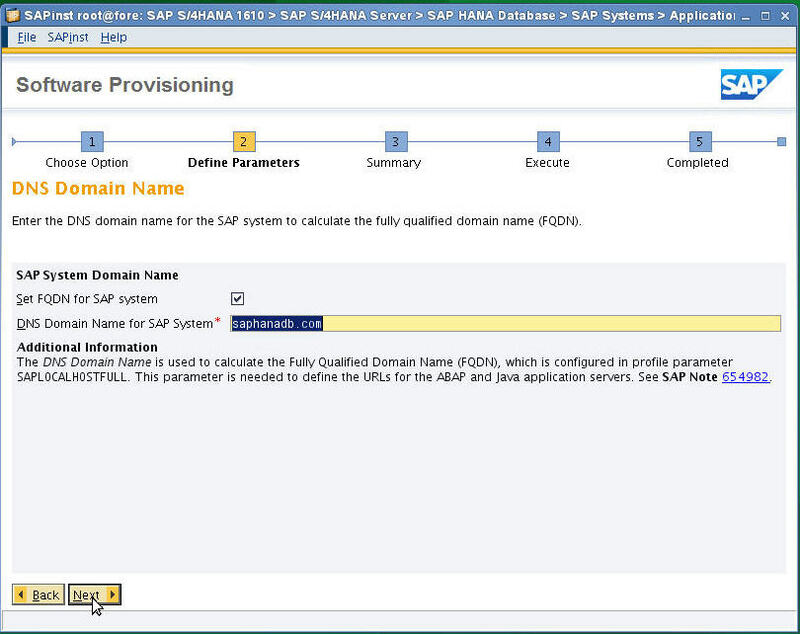 3-5) Select the kernel of S/4 HANA. 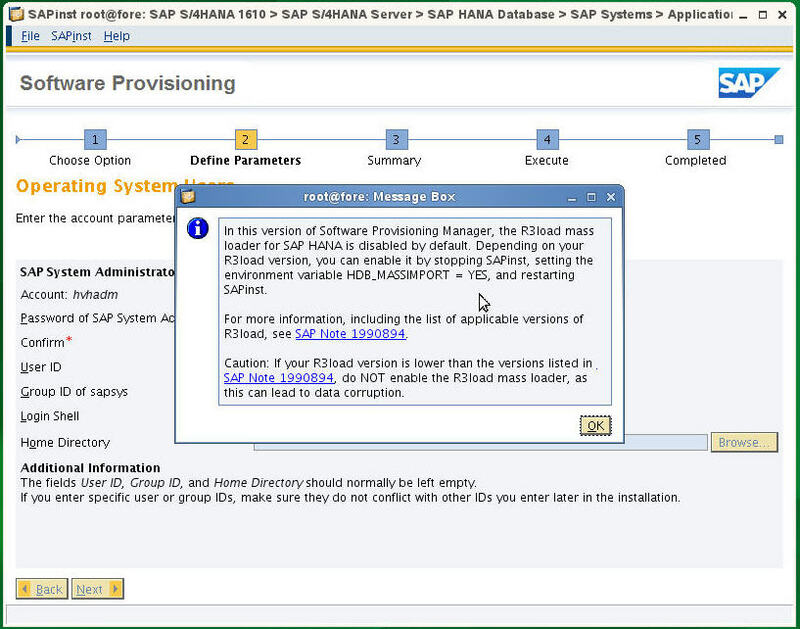 3-6) Select S/4 HANA and make sure that the disk space, host name, RAM Size, SWAP size, etc. are suitable for installation. 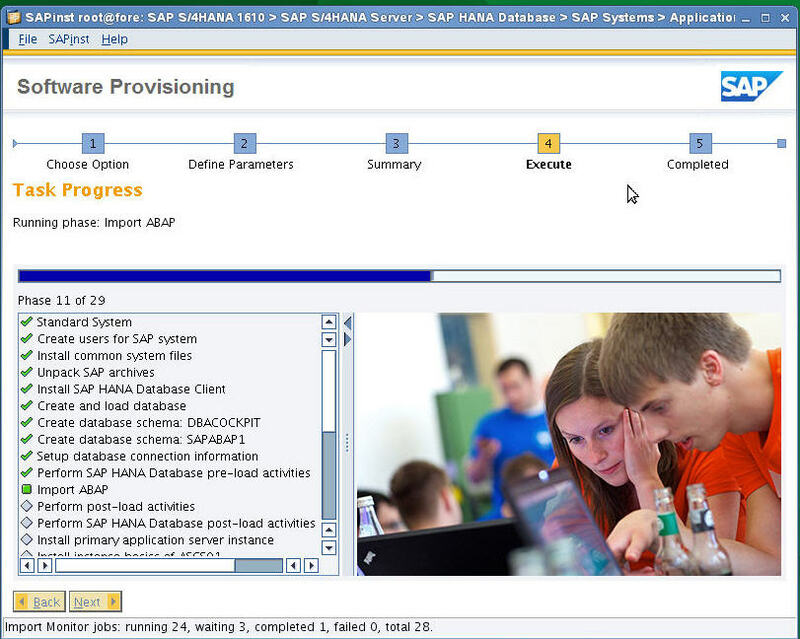 4) SAP S/4 HANA is actually starting screen. 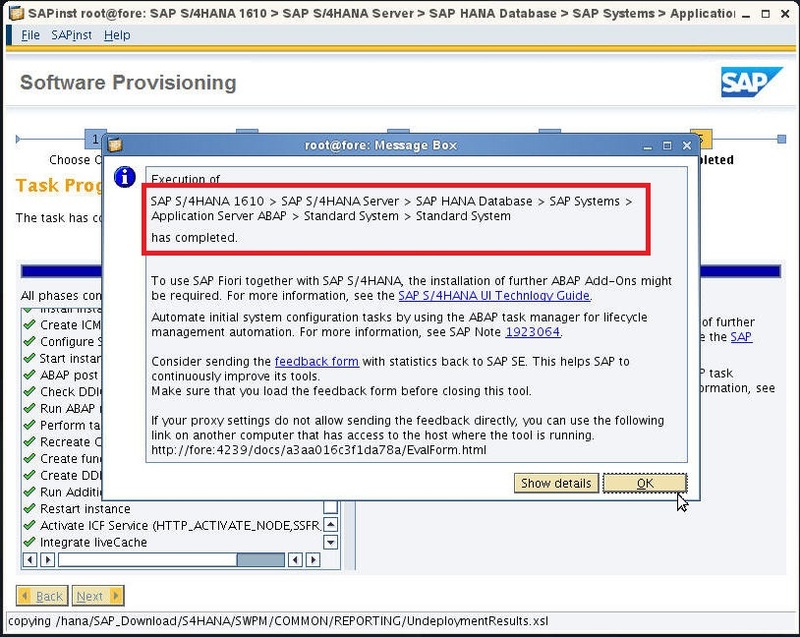 4-1)The path is the select for SAP S/4 HANA 1610 -> SAP S/4 HANA Server -> SAP HANA Database -> SAP Systems -> Application Server ABAP -> Standard System -> Standard System. 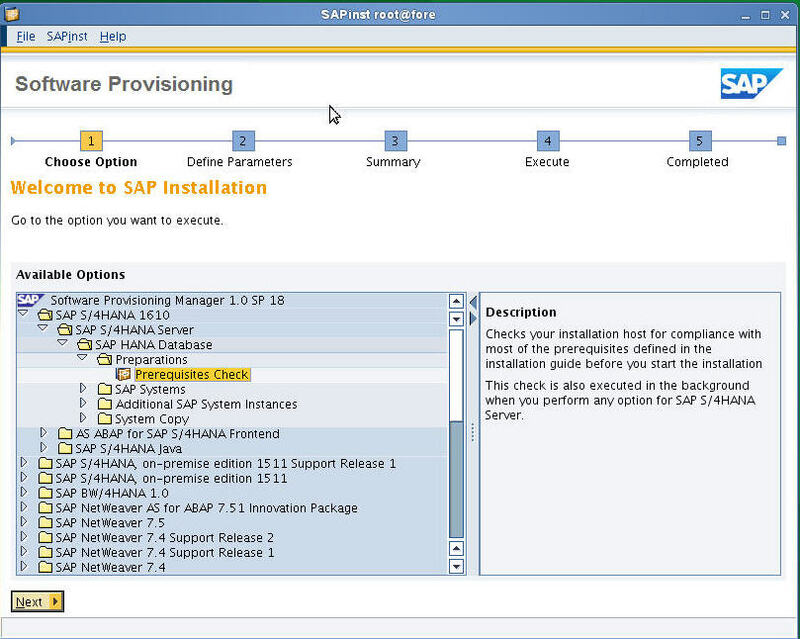 4-2) Select Custom and start the installation. 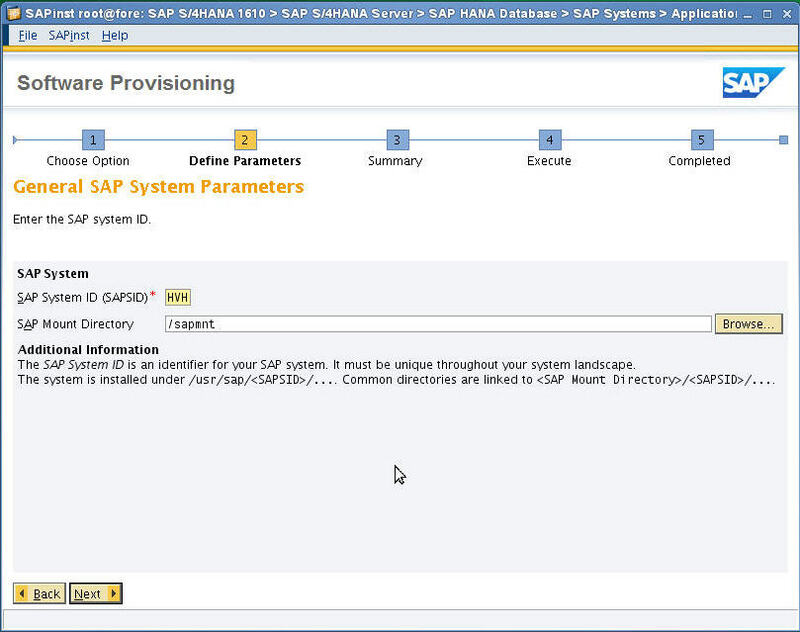 4-3) Enter the SID of the SAP S/4 HANA. 4-4)Enter the information for DNS. 4-5)When importing HANA in bulk, enter “HDB_MASSIMPORT = YES” in environment variable of user sidadm in environment variable and import data. 4-6) Enter the HAN DB SID, Instance Number and System password. 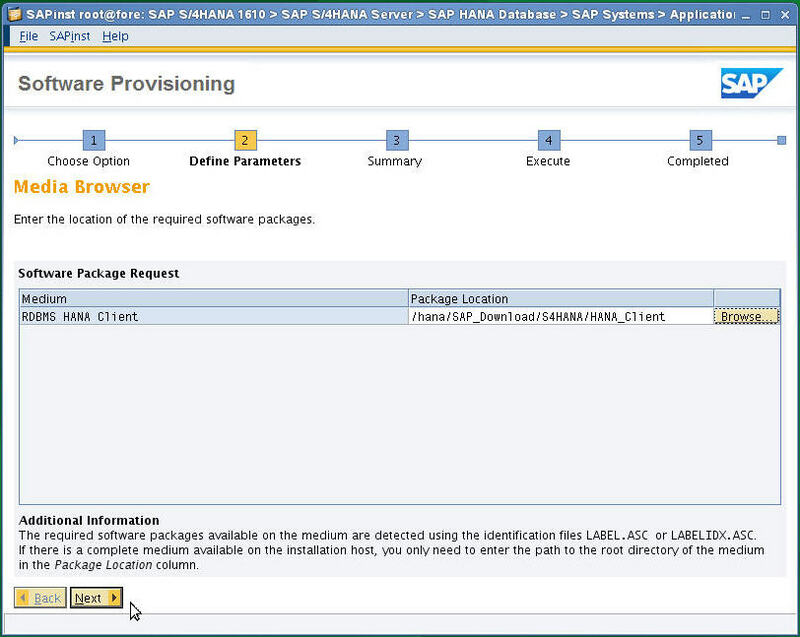 4-7) Enter the location where you downloaded the S / 4 HANA Kernel and click “Next”. 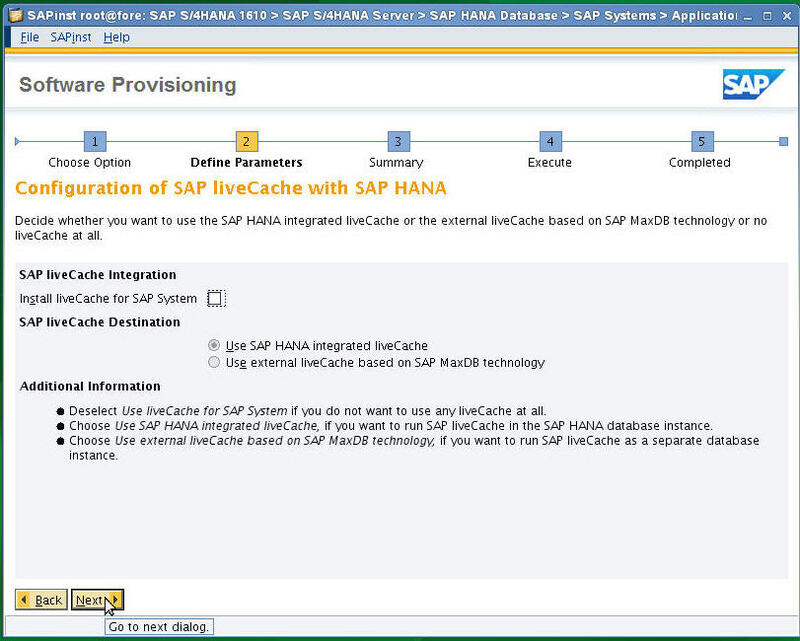 4-8) If you want to install LiveCache on HANA DB, you need to run LiveChain on HANA DB, or if you want to use MaxDB as LiveCache, you do not install LiveCache. 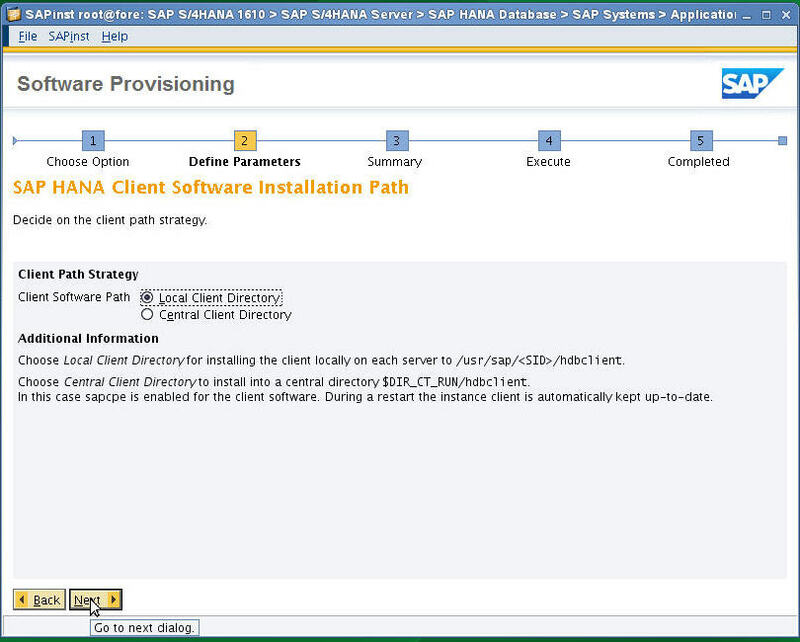 4-9)HANA Client is installed in a central location or on each Application Server (PAS). In general, select Local Client Directory and install it. 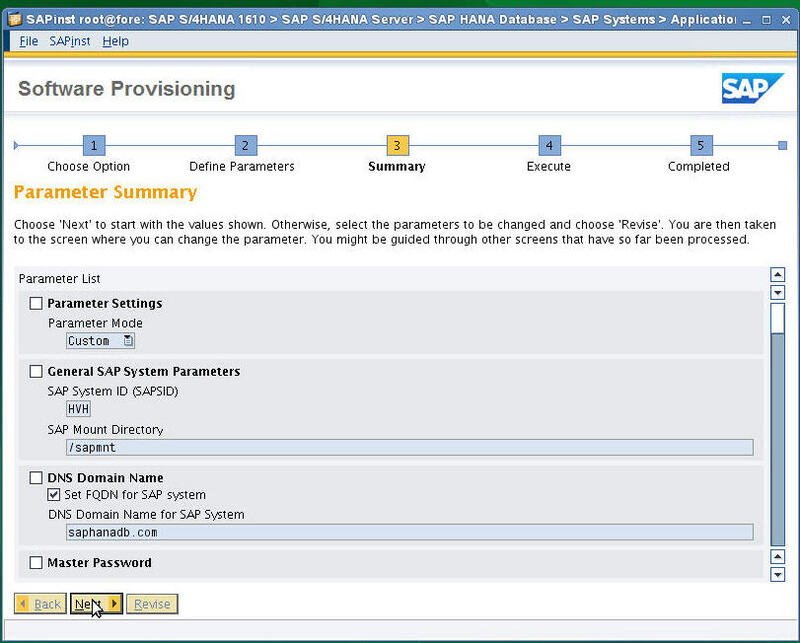 In this case, if there are multiple application servers (PAS, AAS), HANA Client is installed in each AAS (Additional Application Server). 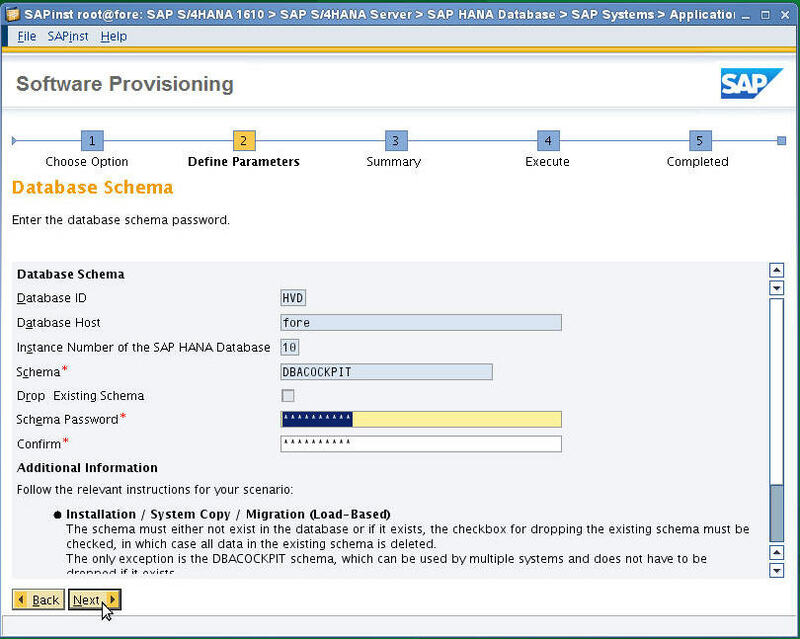 4-10) Enter the client path of HANA DB. 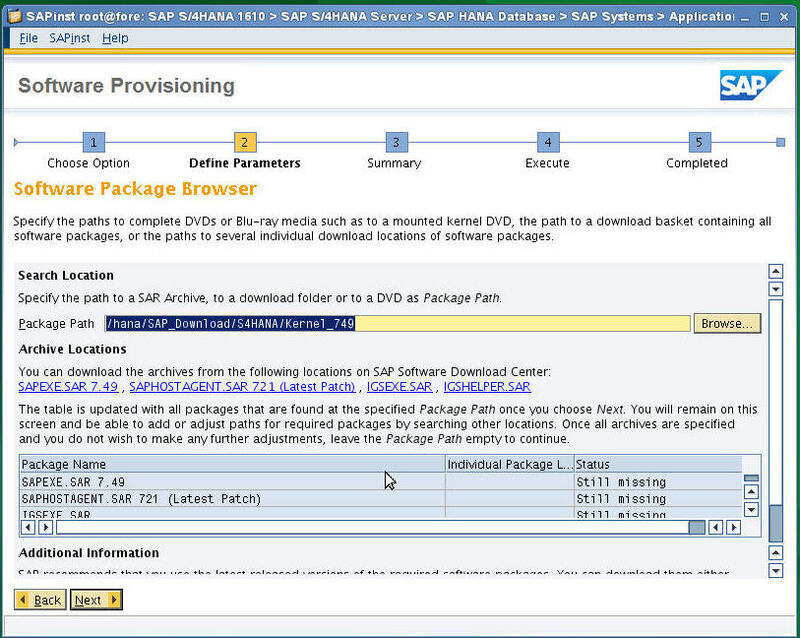 4-11) Enter the Export directory path of the S/4 HANA 1610. 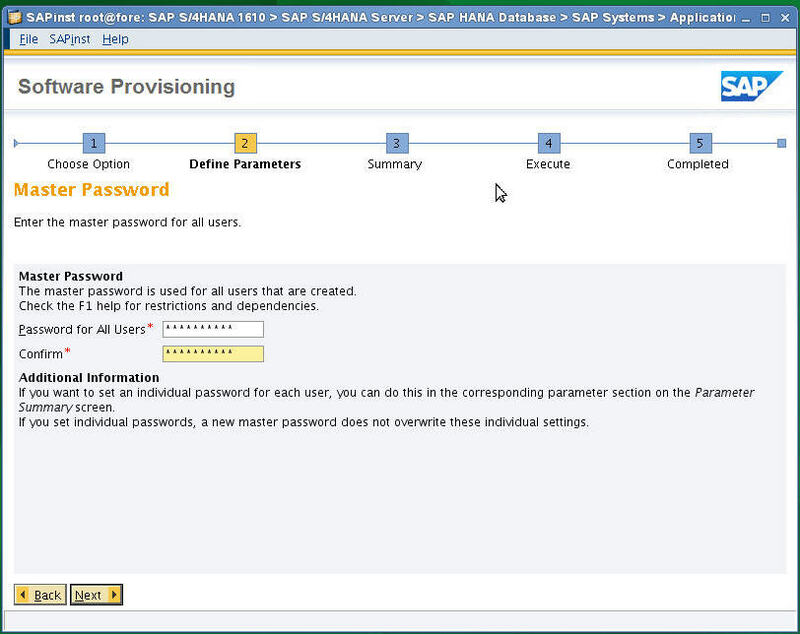 4-12) Enter the password of Instance Nubmer and Administrator of SAP HANA DB. 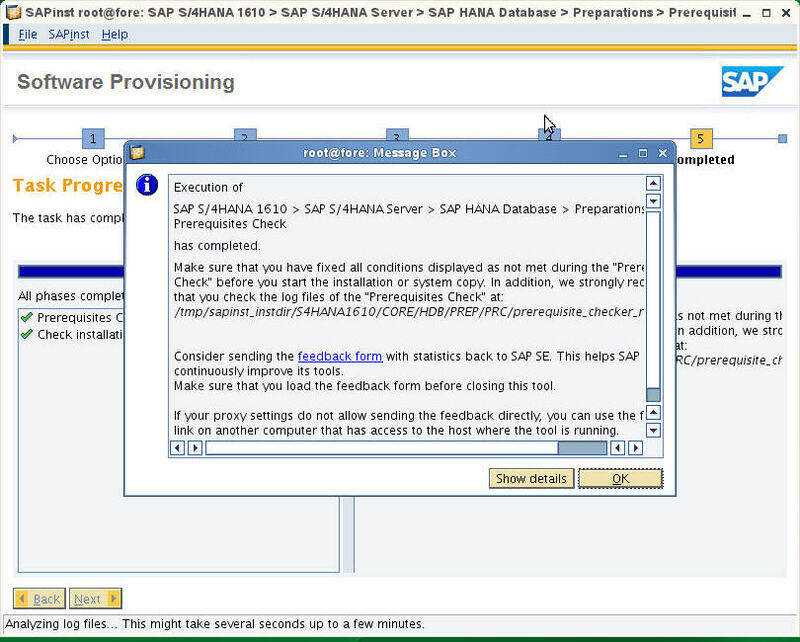 4-14)Here, you will be prompted to modify the parameters suggesting HANA DB memory usage. 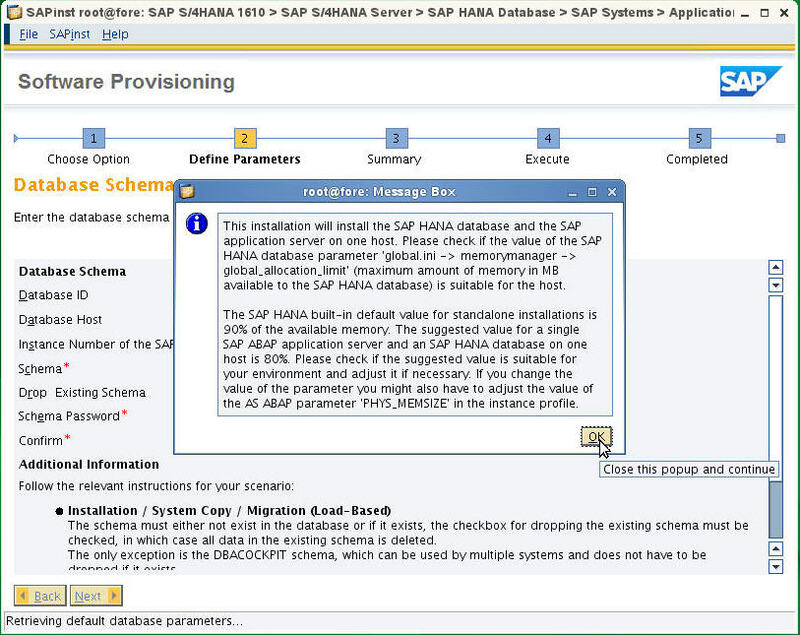 By modifying the global_allocation_limit value of the HANA parameter, the HANA DB can set the maximum amount of memory (global_allocation_limit) that can be used by the HANA DB in the amount of physical memory (physical memory) of the OS so that HANA DB can restrict the use of more memory Give the value. 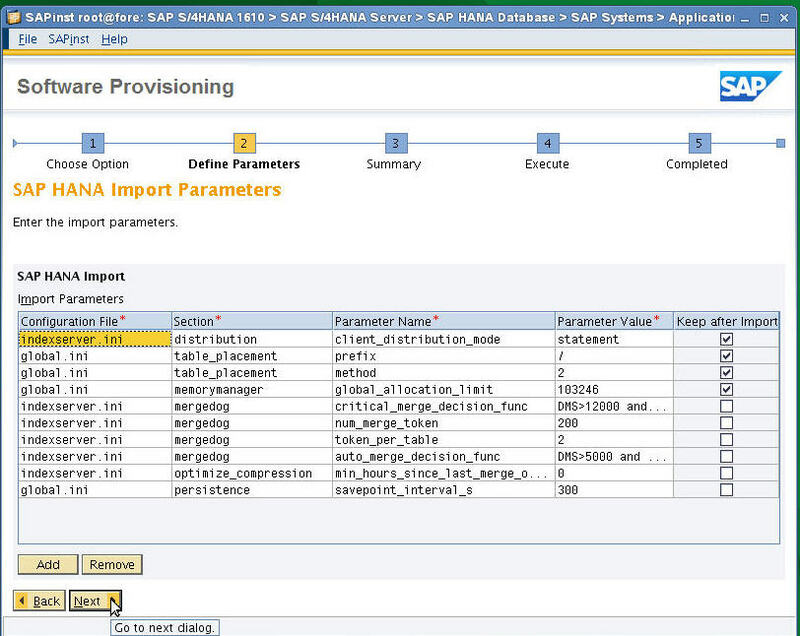 4-16) When the data of S/4 HANA is imported, the parameter values ​​of HANA DB are modified so that it can be imported sooner. 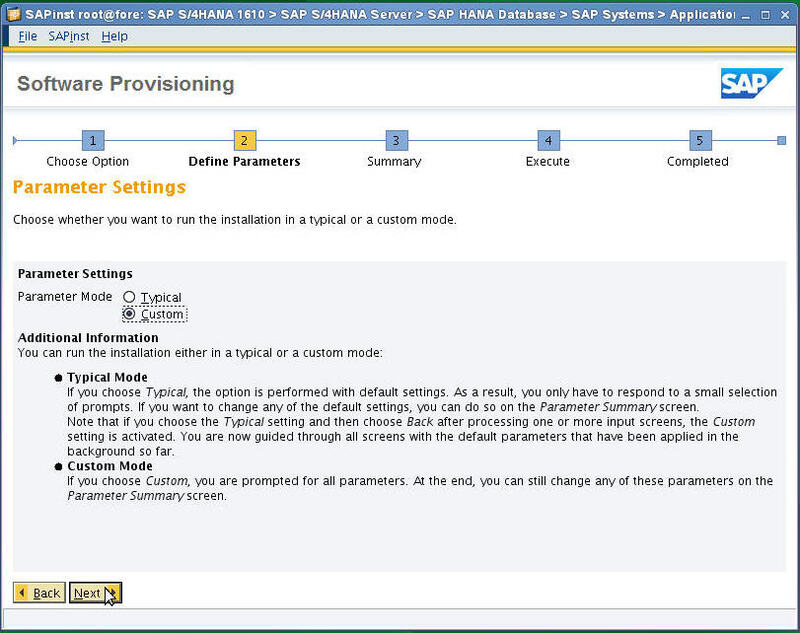 If modified here, the parameter value of HANA DB is changed. You can change the time (second) to write to disk faster by changing the time to savepoint the data to disk, such as savepoint_interval. 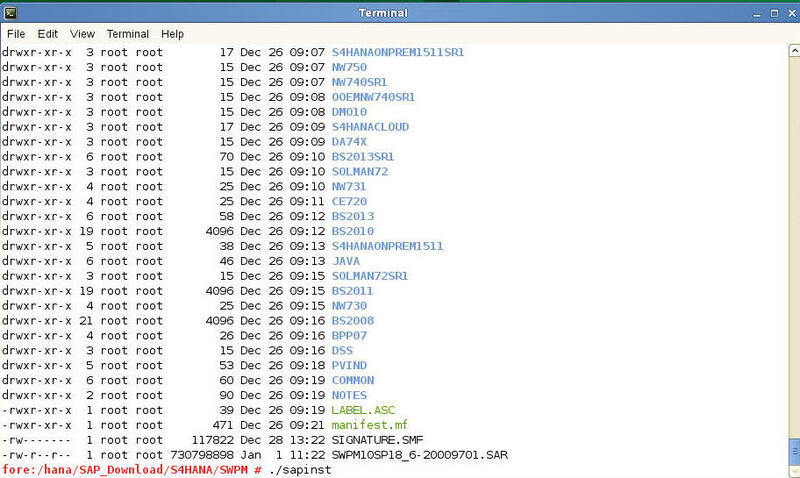 4-16) This is called the database table layout in SAP Netweaver 7.5. In Netweaver 7.4 it is called an option. 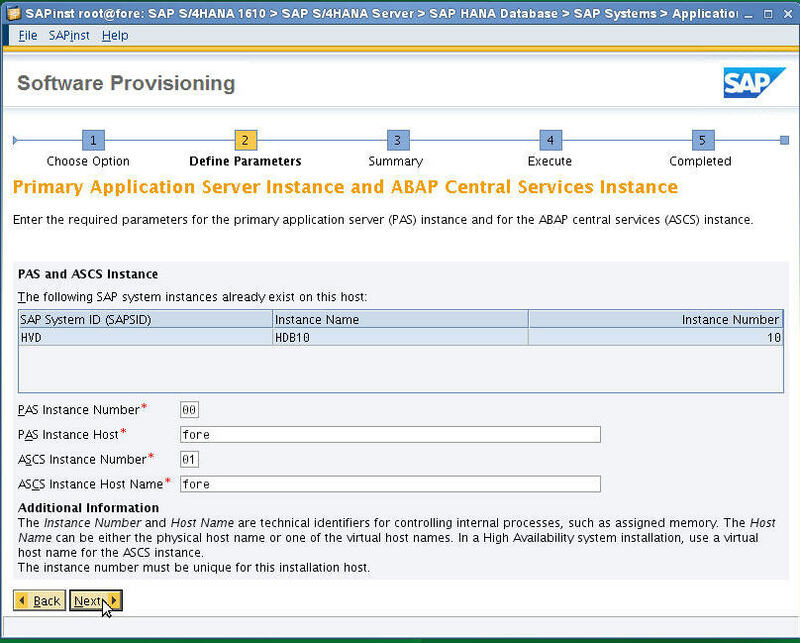 4-17) Enter S/4 HANA’s Instance Number: 00, ASCS: 01. 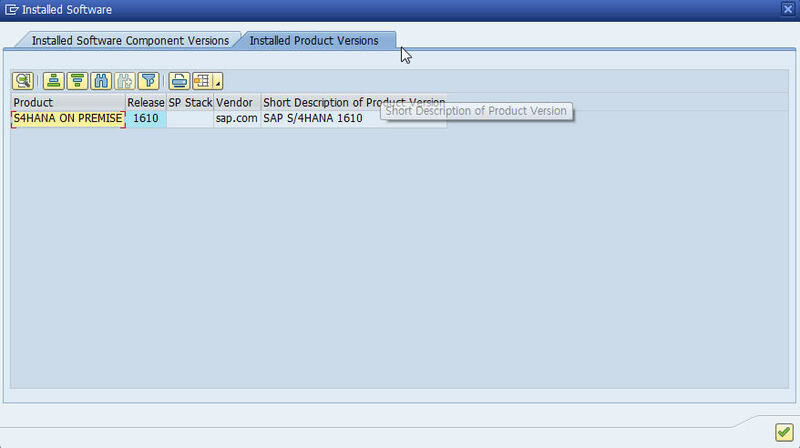 4-18) You can show the options you have chosen to install S/4 HANA, and modify them again as needed. 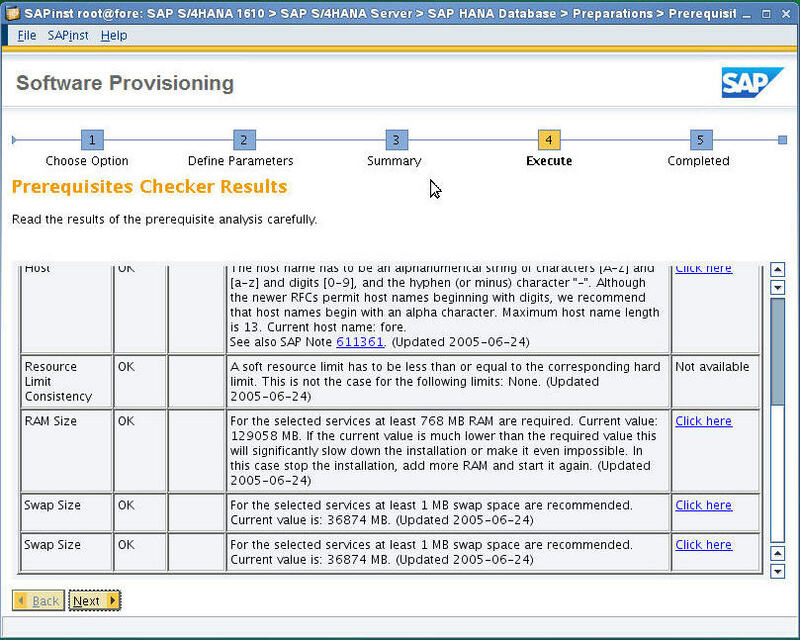 4-19) The installation progress of S / 4 HANA is displayed. 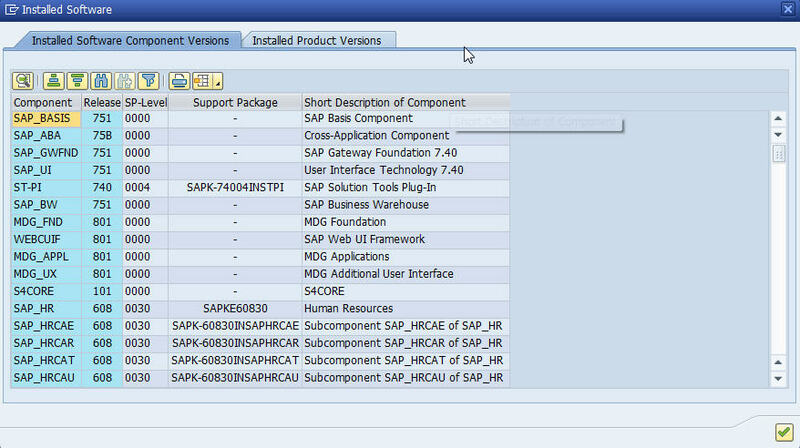 4-21) S/4 HANA installed contents of Component BASIS, ABA and so on.